3. Type-C port with PD charging function, can charge for MacBook. 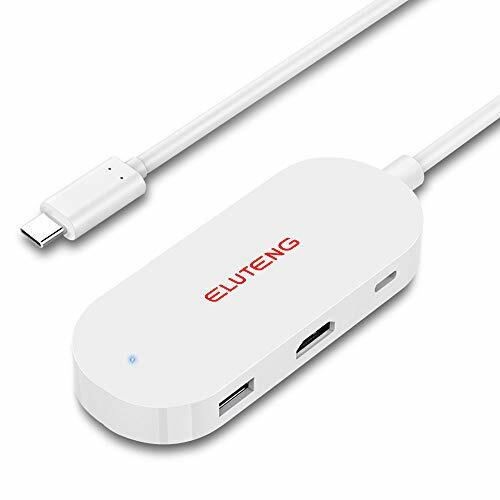 ELUTENG Multifunction 3-in-1 USB C with USB3.0-A & Type-C & HDMI 3 output ports expansion to meet your different requirements. Type-C port support PD charging function, can charge for MacBook to meet expansion and charging needs at the same time. USB3.0-A port can connect U-disk, hard disk, drive, mouse, keyboard, and other USB devices, data transmission speed up to 5Gbps. Plug and play, widely compatible with Windows 10 / 8.1 / 8 / 7 / XP / Vista, Mac OS and Linux. If you have any questions about this product by ELUTENG, contact us by completing and submitting the form below. If you are looking for a specif part number, please include it with your message.